Last August I was thinking of the S&P 500 index and wondered if its uptrend had been exhausted on its way to the upside. The price was at the $2833 level, and it failed to break the earlier top of $2873. The RSI showed the Bearish divergence and the index started to drift lower. I thought it was a complex correction and another drop to hit the lower bound of the $2533-$2873 range was considered to be imminent. The majority of you supported this idea. Let’s check the updated chart below to see what happened next. Updated S&P Daily chart tailored in August 2018. Posted in INO.com ContributorsTagged aibek burabayev Relative Strength Index (RSI) S&P 500 (CME:SP500) S&P 500 analysis technical analysis Trendline AnalysisLeave a Comment on S&P 500: Drag & Drop? So, for now, I see no reason to make dire proclamations beyond that key support level, as so much will depend on incoming information in 2019. At this point, even 2100-2200 is not technically in the bag because the US stock market clung to last-ditch daily chart support, as per the marginally favored short-term NFTRH view. So all of we bear callers need to remember that as ugly as the charts are, support is not broken until it is… broken. Posted in Guest BloggersTagged biiwii.com chart analysis Gary Tanashian Notes From The Rabbit Hole (NFTRH) S&P 500 analysis technical analysis2 Comments on How Low Could The S&P 500 Go? Posted in INO.com ContributorsTagged Relative Strength Index (RSI) S&P 500 (CME:SP500) S&P 500 analysis technical analysis Trendline Analysis1 Comment on S&P 500: Exhausted? S&P 500: Not A Rocket! Back in May, I posted the alert about the upcoming rally of the index in case of the breakup of the triangular consolidation. Indeed, the S&P 500 already booked more than a 100 points gain from that day ($2679) but what I see in the chart now is not inspiring me these days. Below is the new daily chart where I made the annotations to express my concerns. Posted in INO.com ContributorsTagged Relative Strength Index (RSI) S&P 500 (CME:SP500) S&P 500 analysis technical analysis Trendline Analysis1 Comment on S&P 500: Not A Rocket! S&P 500 Finishes Consolidation, Fasten Your Seat Belts! 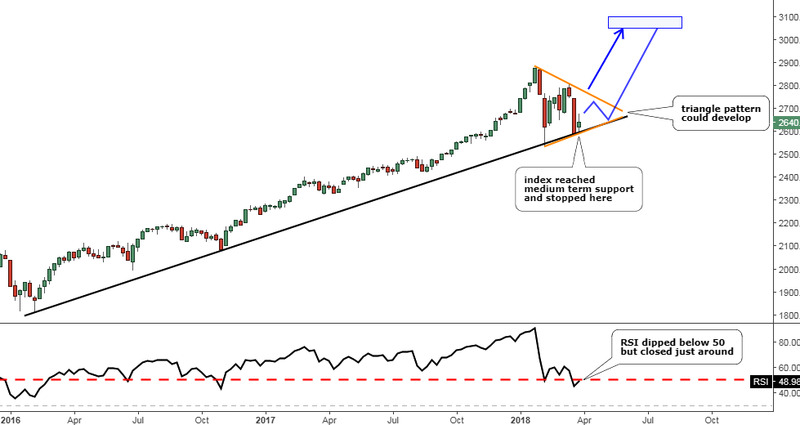 This past February, I drew your attention to the S&P 500 index, which started a consolidation, addressing two critical questions about the future of the index. The most important answer said that we are still in the long-term uptrend and we should keep patience to see the end of the consolidation. Later in April, I shared an update with you with a detailed plan for two possible options of the ongoing consolidation. The first one implied the development of the familiar Triangular pattern, which in its turn had two possible paths of price action. And the second path with a zigzag inside of the Triangle was drawn with an amazingly accurate prediction as the index just repeated its trajectory. Another possible option was described within the forecasted Bull Flag pattern. This model didn’t develop as planned as the price couldn’t break below the previous low at $2532; although we were very close to hitting it as the index’s drop reversed just $31 ahead of it at the $2553 level. This plan is very close to invalidation once the price overcomes the earlier top at $2718. Posted in INO.com ContributorsTagged Relative Strength Index (RSI) S&P 500 (CME:SP500) S&P 500 analysis technical analysis Trendline Analysis2 Comments on S&P 500 Finishes Consolidation, Fasten Your Seat Belts!